Just as I thought. I’m not the only one unfamiliar with this. Popoques are walnut-shaped cookies with a creamy filling. 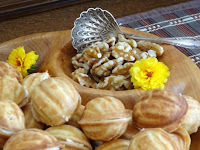 They take their shape from the walnut design from a special press; there are no walnuts in the recipe. “My cooking club recently held a cookie swap, and one of our attendees (who is Armenian) brought Popoques. "The walnut-shaped "shell" is sort of like a tender waffle cone and is not overly sweet. Then you have the wonderful, soft filling. Mmmmm. My friend used a filling for hers that had dulce de leche (1 cup), cream cheese (4 oz. ), and butter (2 oz.) - and they were heavenly!" 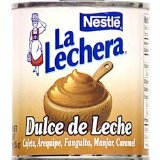 FYI: Dulce de leche is a confection prepared by slowly heating sweetened milk to create a product that derives its taste from caramelized sugar. This is available in canned form in grocery stores which carry Latin American products. I was intrigued, yet not optimistic about finding the press. Being unwilling to accept defeat, I immediately contacted the blogger who had written about Popoques. She suggested I try looking for this press under either of its Russian names ‘Oreshki’ or ‘Oreshnica’. Her suggestion paid off because, naturally, the Popoque (Oreshki) press is available through Amazon.com! 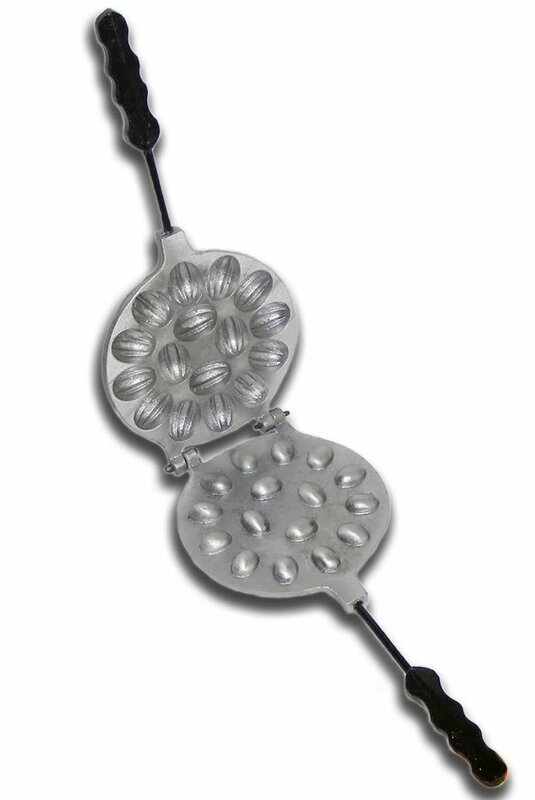 To make things really convenient, you can order the oreshki press (or anything else) by scrolling down to The Armenian Kitchen website’s link to Amazon.com. Interesting aside: The Armenian guest at Lisa’s cookie club who brought the Popoques, was none-other than the author of the website I found while searching for the press - and - the same person I’d been emailing; what were the odds?! ?